Secret Abilities, Hang Time and Eagle Twin all played impressive sets, paying no mind to the night’s at-times-spotty attendance. 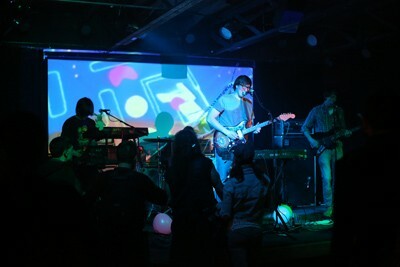 And while at first glance the combination of pop-punk, indie rock and sludgy metal seems like it could’ve been a recipe for disaster, the result was an eclectic night of fantastic local music with a highly diverse cross-section of fans ready to skank, shake their booties and head-bang. Secret Abilities took the audience to the first stop on the night’s crazy sonic journey, serving up a slice of bright, simple, summery rock & roll that evoked The Ramones and The Cramps with some bluesy elements (and a power ballad!) mixed in. 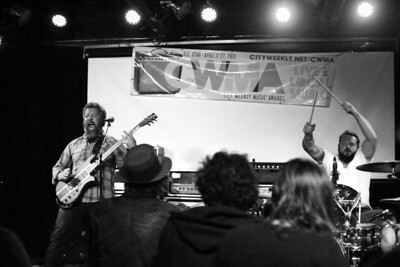 Squeal-filled guitar and yelpy lead vocals (Davin Abegg), a punk-laced rhythm section (Dave Todd on drums, Justin Behling on bass) and jangly tambourine and harmonizing vocals (Tink Safeer) got the audience up and dancing, basking in the healing power of honest pop-punk. 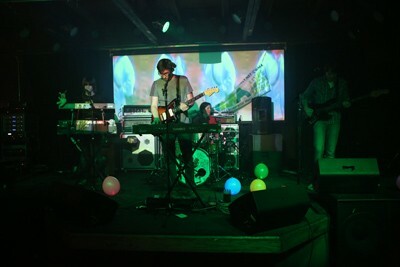 Next up, indie-rock quartet (well, quintet, if we count their fog machine, Yoko Ono, which, of course, we do) Hang Time steered the van into a neon-drenched, candy-coated wonderland. The fun stage setup complete with Andy Warhol-colored projections and illuminated balloons (that I wanted to steal but didn’t, promise), contributed perfectly to the candy-cane-forest vibe. Edgy guitar (Will Sartain & Andrew Sato), bass (TJ Fitzgerald) and drums (Cathy Foy) were obscured with a sugar-sweet frosting layer of triple keyboards (Sartain & Sato) that made the entire set feel like the awesome soundtrack to an 8-bit video game—a feeling enforced by the projections from old-school video games like Mario Bros. and Pacman. If you wanted to snort some pixie-stick powder and watch cartoons on a basement couch, dreamy songs like “Awesome/Rad,” “Turquoise” and “Big Kids” would be the perfect musical accompaniment. And as the audience took to their feet to dance and kick around the glowing balloons to a backdrop of nonsensical projections like Hulk Hogan and a dating show called Love Connection, the van climbed a range of cupcake mountains and splashed through a chocolate river. But then it all went wrong. The van’s back tire exploded, causing the vehicle to spin out and crash in a dank, dark swamp. 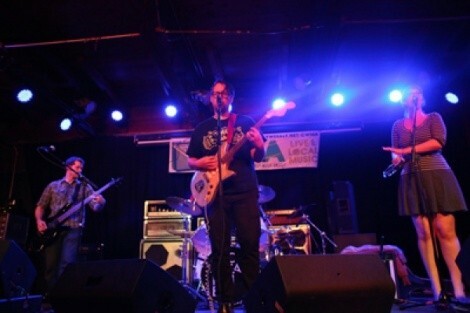 The lights dimmed and turned a fell shade of green, and Eagle Twin took the stage to shouts of “Motherfucking EAGLE TWIN! !” And ringed by long-haired head-bangers, the demonic duo of Gentry Densley (guitar, lyrics) and Tyler Smith (drums) kidnapped the audience and proceeded to eat their brains. I’ll be honest, I don’t know a thing about metal. But I do know that the seriously epic drumming and Densley’s powerful, Viking-worthy voice caused my jaw to drop. And it stayed on the floor for the duration of Eagle Twin’s set, which proceeded with hardly a break or mention of any song titles. 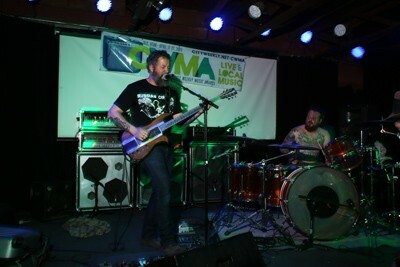 The extremely intricate drumming paired with Densley sometimes screaming into his guitar created a heady metal sludge. One of the best moments of the set was when Densley bent down, scooped up one of Hang Time’s loose glowing balloons, and murdered it with his bare hands. It was a fantastic night! The weird sonic combination of pop-punk/indie-rock gumdrop fields and metal-y blood-soaked hellscape totally worked, and it seemed like I wasn’t alone in being a non-metalhead who got into Eagle Twin’s set. Once the duo hit their stride, the dance floor filled up with lots of intrigued, decidedly non-shaggy-headed audience members. I’m not sure what the Eagle Twin fans thought, though. “Anyone who came here for Eagle Twin is like, ‘What? This is weird,’” Sartain said at one point. But it was a journey filled with magic and metal, and a fantastic example of the diversity present in SLC’s music scene. 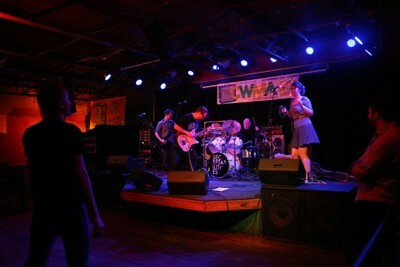 Stay current on City Weekly's Music Awards updates and vote for your favorite band at CityWeekly.net/CWMA. And follow the action on Twitter by using #CWMA.